MACEDONIA’S REFERENDUM FARCE – Alternate Comms. 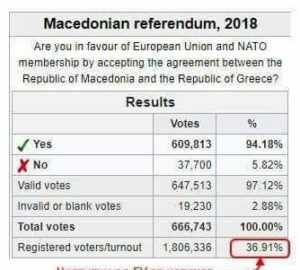 REFERENDUM FARCE – the flop being hailed as a “success’ – we’ve all had over 24 hours to digest the outcome of Macedonia’s failed referendum held on Sunday 30 September, which is what it was despite the deliberate spin from the Zaev government and its foreign backers, namely US Ambassador to Macedonia Jess Baily. If you do a break down of the figures – 36.9% of eligible voters turned out and 94.18% voted in favour. Rough arithmetic that’s about 25 to 30% of all eligible voters voted in favour of the referendum. Simply put the vast majority of Macedonians and even a sizeable number of ethnic Albanians don’t want to change Macedonia’s name. Regardless of how people voted or didn’t vote, what can’t be ignored is there was a movement/s dedicating to boycotting the referendum. If a large number of people didn’t turn out then that must be attributed to this movement. Obviously, regular voting patterns in Macedonia can’t be ignored. 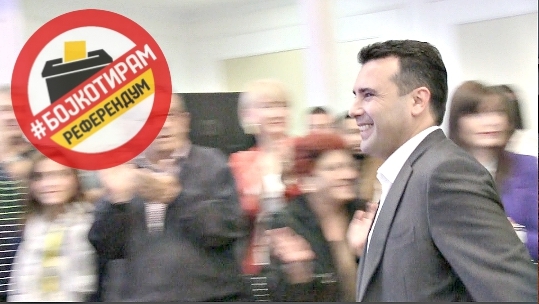 So it’s now hard for PM Zaev to claim a moral mandate over the main Opposition party VMRO-DPMNE led by Christian Mickovski to support the Prespa Agreement through a parliamentary vote. The standard mantra from the Macedonian Prime Minister Zoran Zaev, who immediately after the referendum flop broke a promise that he would resign if it failed, is the Prespa Agreement was the best possible deal that Macedonia could get and was the result of Greek and Macedonian compromise. One of his senior cabinet ministers, Justice Minister Renata Deskoska doesn’t even know who wrote the agreement, which is an incredible and embarrassing admission to make. Macedonia’s Defence Minister Radmila Sekerinska, when asked if an American academic and ex US State Department official Dr Amanda Sloat was the real author, exploded with inexplicable rage. The woman who is alleged to have put the agreement together, Dr Sloat, has remained silent despite being contacted and asked to set the record straight. What is telling is the US Ambassador to Macedonia Jess Baily after also being asked to comment more than a month go if there was any US involvement behind the scenes declined at that time until he was confronted at a doorstop interview yesterday where he gave an answer after an OSCE post referendum media conference. The OSCE was tasked in monitoring the referendum for any irregularities. Ambassador Baily was asked at point blank about Dr Sloat’s involvement. 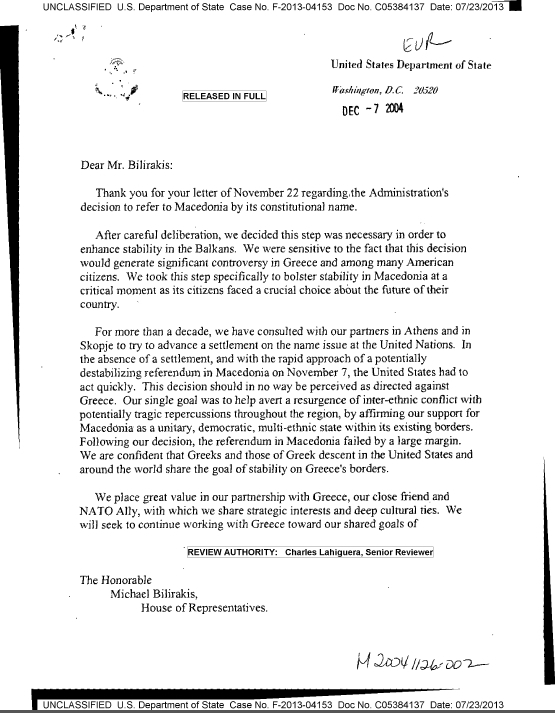 In an amazing display after deliberately walking past in an attempt to ignore the question he decided to comeback and stand his ground and answer the question in which he maintained the mantra of it – the Prespa Agreement – being the product of Greek-Macedonian negotiations. It would have looked horrible if the man who has staked his diplomatic career on the Prespa Agreement was seen to run away from it. This isn’t Ambassador Baily first time to dodge a question over the controversial agreement. If it takes all of this effort just to get a response over the Prespa Agreement – using pliers to extract words out of key people’s mouths figuratively speaking – despite all the positive spin placed on it then this suggests there is clearly something wrong with it. 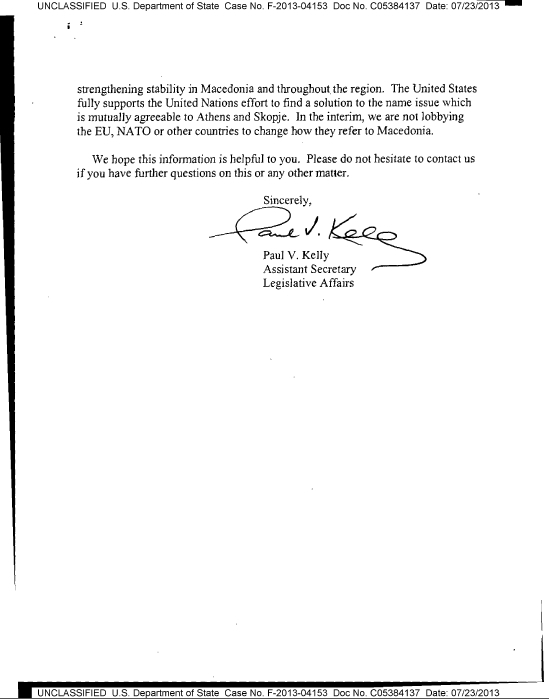 The US is riding roughshod over Macedonia’s sovereignty by Ambassador Baily taking such an “active” role in now pushing the Prespa Agreement through the parliament after the failed referendum. Support for the US Macedonia was historically high especially amongst the diaspora – that has dropped remarkably because of the antics of Ambassador Baily and without Russian strongman Putin needing to lift a finger.